As a Software Development Company what can we do for you? Greenfinch Technology is a software development company focused on solving your business problems. We do this with both innovation & quality in our technology software solutions. We provide our clients with the best 'Design, Build & Manage' service in order to help them meet the challenges to their business in today’s fast-changing world. Greenfinch Technology is an award-winning software development company. We recently won the Irish Web Best Practice award. This means that not only do we think that we have the best software development cycle, but others do too. 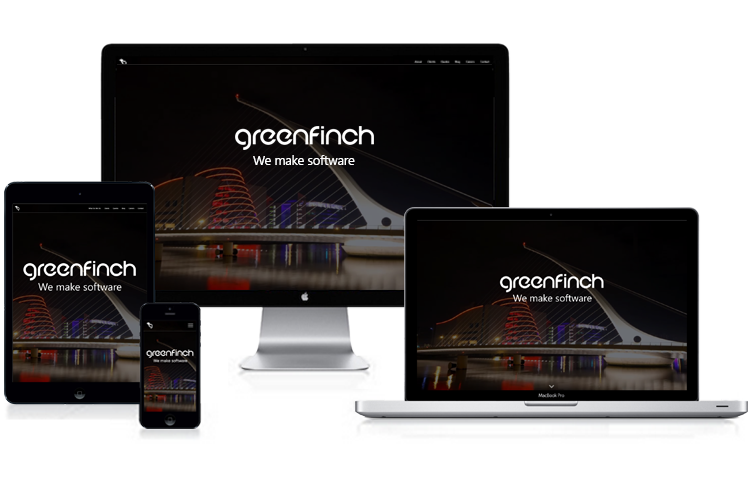 At Greenfinch our highly experienced team of software developers work with you, the client, to ensure you receive an excellent product. It is because of this work ethic that we received the 2017 Irish Web Best Practice award. We always go the extra mile to ensure client satisfaction. When looking to develop a piece of custom software you need to know that the custom software development company you hire have the unique ability to visualise your real-world problem and to be able to code a well thought out solution. As our team presently consists of almost 40 experienced software developers we have a vast array of skills. ASP.NET MVC, ASP.NET, Xamarin, SQL WCF, Reporting, WPF, Azure Cloud, SQL Server, and Power Apps. Apple iOS, Google Android OS, Universal Windows Programmes, Xamarin, Cordova, Ionic, Phonegap. HTML5 & CSS3, Sass & Less, Java, Objective C, C/C++, Swift, Angular, Knockout JS, PHP, C#, Sencha Touch. CRMs, Enterprise Content Management, ERP/MRP and Business Intelligence, Corporate Intranets. Online Stores, Internet B2B and B2C Portals, Social Commerce, Social Networking, Marketplaces, and CRMs. Facebook, Google Maps, Authorize.net, PayPal, Stripe, Google Analytics, LinkPoint, and 2Checkout. We understand mobile applications and strive to offer the best solution to our clients to meet their objectives. "The Greenfinch project management experience and depth of software development skills were essential in contributing to the success of our project." "Greenfinch is a highly valued partner to H&K and their team enable us to meet our customer’s needs by developing innovative solutions that keep us ahead in the market." "I just did a first full "dry run" on the production application. Everything worked perfectly and without a glitch! Great work." "Our business is based on delivering complex solutions to our customers. It relies 100% on technology and needs a trusted partner who can be relied on to deliver these mission critical services while bringing technical innovation to our solutions. Greenfinch are that partner in every way." "Every single member of Greenfinch is outstanding in their area. They continue to do work with us and we keep going back to them. No need to look any further." "We’re impressed with the delivery and method, so much so that we’ve hired Greenfinch to develop a second application." Greenfinch is proud to announce that it has been recognised as a Xamarin Premier Consulting Partner - the first Irish-owned company to achieve this status. If you're interested in joining the Greenfinch team get in touch!